Quick idea for something hand made. To produce a whole variety of unique tags in no time at all. One of the simple pleasures during the lead up to Christmas for many people is handcrafting. 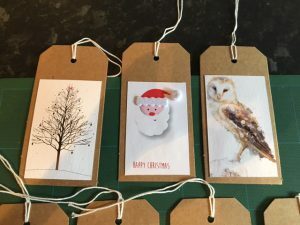 As a primary school teacher I used to spend a huge amount of time making cards, gifts, decorations and all manner of Christmas goodies with the children. 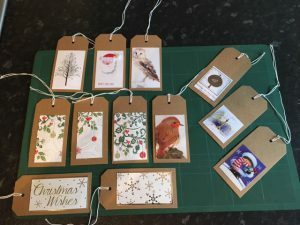 Since retirement I have not done much craft work but this year I decided to turn my hand to a few simple efforts which I will share with you – if the results are presentable. Today I have spent my spare time hand painting some fallen pine cones and even rolling some of them in silver glitter. I am leaving everything to dry while I am out partying tonight and then tomorrow comes the assembly of something which up to now has only existed in my head! Watch this space. 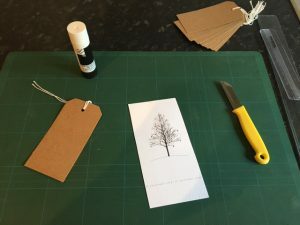 Make a card or just a gift tag for someone you care for. It’s very therapeutic and the result is so much more personal.